Cooking chicken wings in the Instant Pot was one of the top things I wanted to try in the IP and let me tell you, it works amazingly! It’s so simple too! 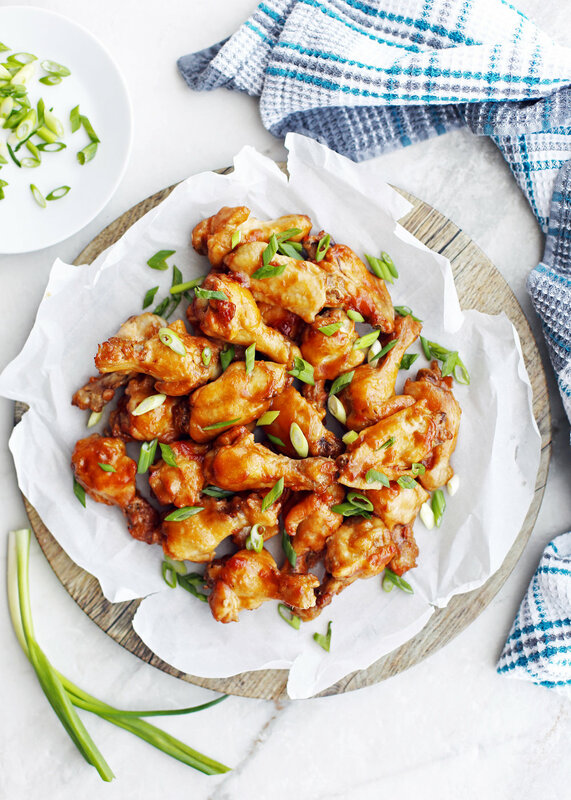 Fill the Instant Pot with a small amount of water and orange juice, place the trivet on top (I used the one that came with my Instant Pot), add the chicken on top, let the Instant Pot do it’s thing, remove from the pot, and then toss the wings with your favourite sauce. Then bake or broil the wings so that the sauce really sticks to the chicken! For these wings, I’ve included a tasty recipe for scratch-made orange teriyaki sauce. It’s salty and sweet with a citrus note. The salty, umami flavour is from the soy sauce, sweet flavour from the brown sugar and mirin (a Japanese sweet rice wine), and bright, citrus flavour from the orange juice. Combined these ingredients with a little garlic powder (for that pungent kick) and ground ginger (warming and spicy) and you’ve got an a flavourful sauce that’s perfect for wings! I like to make this sauce while the chicken cooks, which cuts back on the overall time spent in the kitchen. The sauce for these wings is based off the teriyaki sauce that I used for my recipe for Teriyaki Chicken Rice Bowls with Garlicky Kale. Once out of the Instant Pot, the chicken will be fully-cooked, fall-off-the-bone tender, and ready to toss in the sauce and eat. Since these wings are steamed and not fried, it’s a little bit healthier than its fried counterpart. I like to place the wings in a heated oven for a short time to allow the sauce to really stick to the chicken and get all sticky and shiny. Or you can broil the chicken wings on each side to get them a little charred if you like it that way. In addition, this recipe can easily be scaled up or down (use the same cook times)! Just make sure the wings do not go passed the “max” line on the pot and that you make enough sauce to really coat the wings. Or you can cook the chicken wings in batches so that you have wings in the Instant Pot and in the oven at the same time. Therefore, you can make a generous amount for yourself or to feed a small crowd. This would be awesome to make for your next game day party, stay-at-home movie night, or just to make as a snack! I hope you enjoy this recipe. If you try it, please leave me a comment and rate the recipe down below. You can also tag me on any of my social media. I love food pictures! Seal the Instant Pot and cook at high pressure (“manual”/"pressure cook" function) for 5 minutes. After it is ready, allow natural pressure release for 10 minutes before a quick pressure release to completely depressurize (until floating valve drops). For the orange teriyaki sauce. While the chicken cooks, place a small saucepan on the stove, and add in warm water and cornstarch, whisking until the cornstarch dissolves. Add the remaining sauce ingredients into the saucepan and turn on the stove to medium-high heat. Whisk frequently (reduce to medium-low if it begins to bubble over) until the sauce is thickened. Remove from heat and set aside. Put it together. Once the Instant Pot is depressurized, open the pot, remove the chicken wings and place them into a large bowl. Pat dry with paper towels. Pour the sauce on top and toss until the chicken wings are well coated with the sauce. 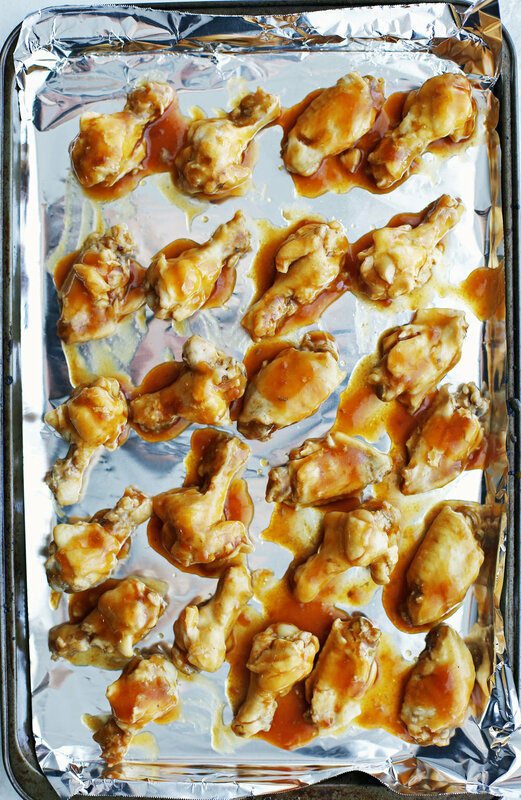 Preheat the oven to 400 F. Place the chicken wings in a single layer on an aluminum foil-lined baking sheet (reserve remaining sauce in the bowl), and bake for 10 minutes until the sauce is sticky and glossy. *(see second note for another method). Brush chicken with remaining sauce if you like. Best served immediately. *The liquid on the bottom of pot should not be higher than the trivet. 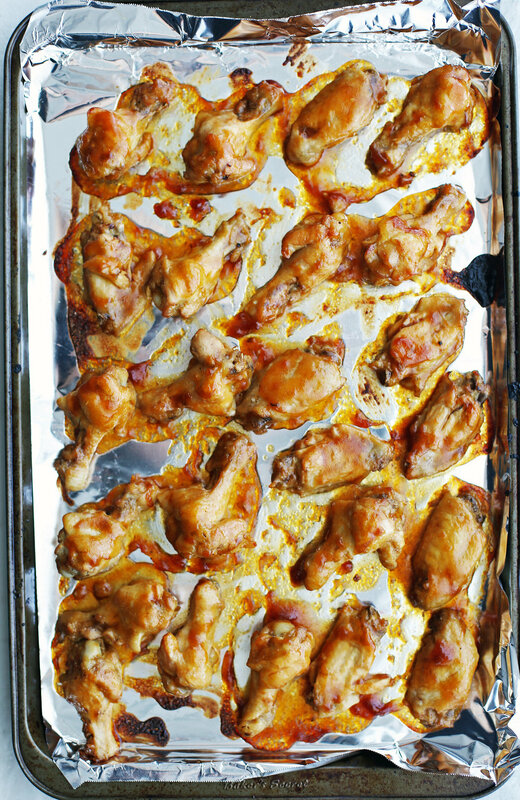 **Instead of baking the wings, you can broil them. Place the oven rack 6-7 inches from the heat source and broil the chicken wings on high for 3-5 minutes on each side until slightly crispy and lightly charred.